3D printer improvements: Help yourself: compatible 3D printer parts that are easier to swap! The overall idea is: if assembly takes a few minutes instead of hours, then many more alternate designs can be tried in a given amount of time. That includes minor revisions, aesthetics, and even weird/improbable options that sometimes proves valuable. In the other case, assembling and disassembling the annoying intermediate parts just makes me lazy... and I may miss real improvements! 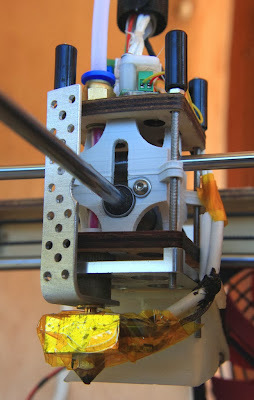 Middle-range 3D printers like the Ultimaker require a lot of time and effort when it comes to "serious" modifications. It is even harder when your deal with the printer head or gantry. 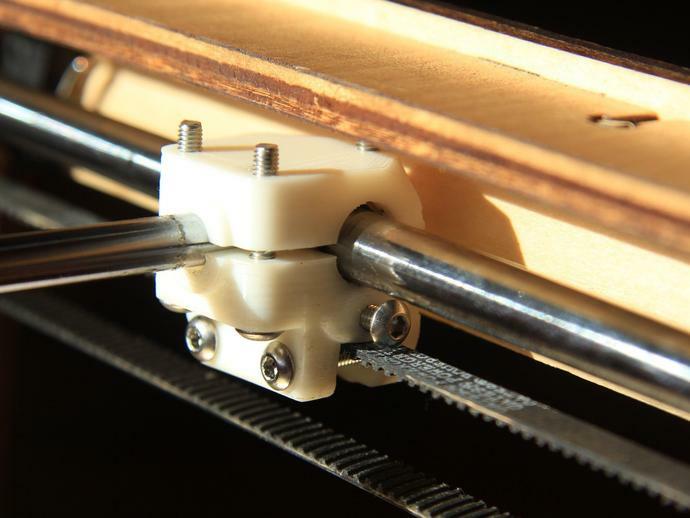 In this regard, the Ultimaker plywood gives more freedom to the tinkerer than metal frames or closed boxes (eg. Makerbot steel frame). But why should it take one hour just to swap the printing head structure? Now, companies that sell 3D printers do not share the same goal as me (check my deeper analysis here!). To recap briefly: they sell Ultimaker printers, not geeky frames meant to be tweaked. They also have production / productivity requirements, even though Ultimaking is one company that probably work much closer with the community than others. Having a tricky setup, or difficult-to-source parts could even be a marketing strategy to compensate for the open source design. Now, reciprocally, they also benefit from improvement from the community (legally, as opposed to some others...), see eg. 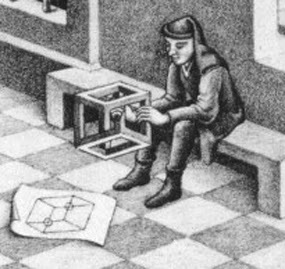 the SD card Ultipanel (Bernhard Kubicek: why hardware hackers should investigate design, or, the tale of the UltiPanel), or Bertho's ball bearing idler. One example are the X/Y bushing blocks: the stock ones are both a weak part of the printer in my opinion and are also extremely annoying to change: you need to remove the axis bearing caps, loosen the pulleys, slide the rods out of them so you can finally remove the damned 5 bushing block plywood layers (that take time on their own to unbolt)... And worse, you just lose all the very important gantry calibration in the process: you will have to fine tune it again and again each time (rod orthogonality, pulleys, alignment, belt tension). One of my wooden blocks started to break (see above). 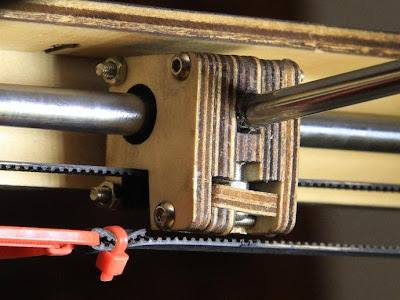 So I took the time and finally managed to get a good idea how to design a replacement to fix it, while it would act also as a good belt tensioner (another item that is not perfect on the stock printers imho). Now, better think twice before printing the first candidate, because guess what... someone told me that the background block I did not use was hitting the Z screw and was then unusable! Oops... He had no other choice than to disassemble the new failing block, mount the stock item back, re-calibrate the whole, print my upgrade, and do it all again! One cycle may take one hour, so one cycle is already too much, even though my own blocks require a few screws to go without disturbing the whole setup. To illustrate how annoying the stock process is, once the blocks were stable, a user of my new blocks just went the "one way trip to banana city (maxy)" by destroying the existing blocks with a pair of cutting pliers just to avoid the lengthy disassembling. And, hey, I did the same for my last blocks with no regret, even though this is a definitive move indeed! Prototyping new heads vs. keeping something safe? I spent a lot of time on hot ends, which in turn required me to design new mounts. But I still have only one printer and it impacted me more than expected, especially when would-be customers or contacts ask for a demo. For sure, my weird homemade hot ends proves I really like to prototype! But sometimes they are just not reliable enough for live samples and they may become counterproductive: what if it miserably fails during the presentation? I need a fallback. useful for experimenting (I can swap it easily now). By the way, check this novel but efficient heatsink! I do have spare working heads with the stock wooden walls. But they are amazingly annoying to change, because you need to remove the X and Y rods as they go through the plywood wall, and deal with many screws and nuts that fall within, losing the calibration and so (you get the trend here?!). Building upon my new head designs, I finally ditched the stock wooden frame and I designed new ones that did not require any other part of the printer to be dis-assembled because they come in two horizontal parts (instead of 4 vertical walls featuring a dumb hole right in the middle of each of them). They can be swapped in and out under a minute, because they just can be sled around the unchanged rods. Let it be clear: these objects just do not add any new functionality (well, still a minor one for locking the linear bearings properly): no, the novelty is really that they are easier and much faster to mount, with no impact on any other printer setup contrary to the stock ones. So why is it useful to re-design working parts without added functionality? My frame serves my initial purpose: I just wanted to be able to mount the stock hot end in minutes whenever I need it, and deal with experimental setups as easily on the other hand. It may go beyond, since it may help a few other people to try and design their own head and hot ends in turn, and may be I would benefit myself from their own discoveries. 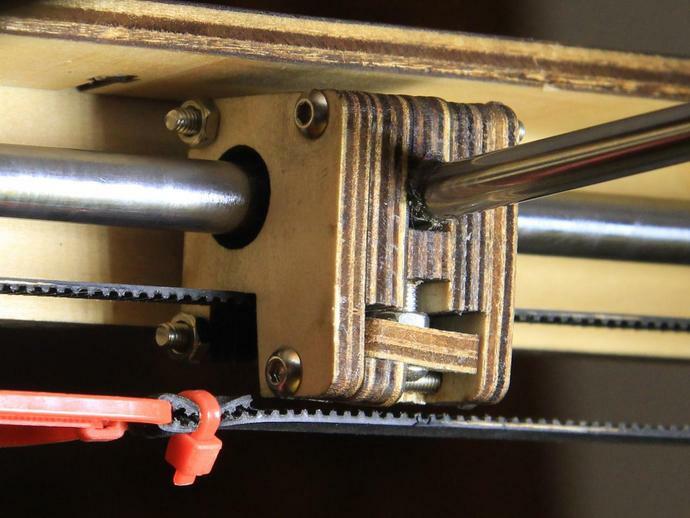 The stock hot end frame simply tends to get in the way of such creative and iterative design processes. All in all, that is to say that easily un-mountable parts are a big plus: they let me and you spend more time fine-tuning the design itself, by reducing the time it will take to design subsequent parts... and they also let me get back to the original design when I fail!